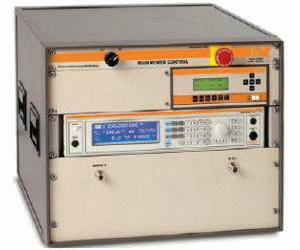 The Model CI00400 is a fully self-contained state of the art system designed to test RF Conducted Immunity. The CI00400 contains all the instruments needed to perform conducted immunity testing for MIL-STD-461D/E, DO160D/E, and IEC 61000-4-6 specifications. The system contains a signal generator, 2 channel power meter, 100W nominal AR amplifier 10kHz to 400MHz, directional coupler, and control software. Everything is contained in a single housing, which eliminates setup issues. This system provides the versatility needed for every test laboratory and equipment manufacturer. The RF amplifier and the signal generator can be used independently of the system. If special needs arise or standards were to change a larger amplifier can be connected to the system. The use of spectrum analyzers and monitoring equipment may also be controlled by the software.